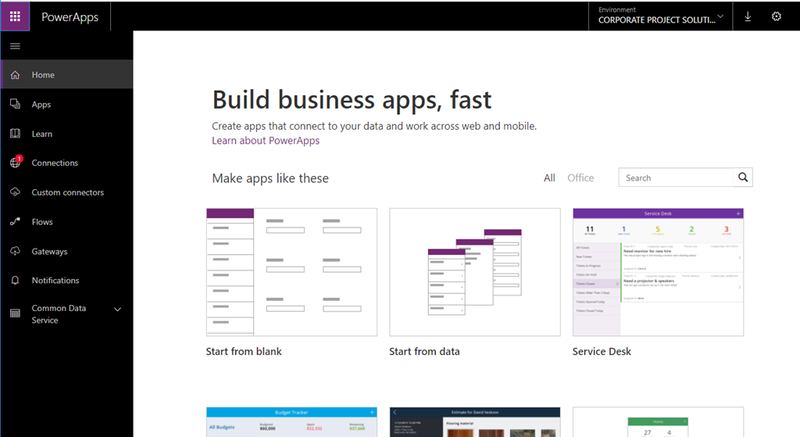 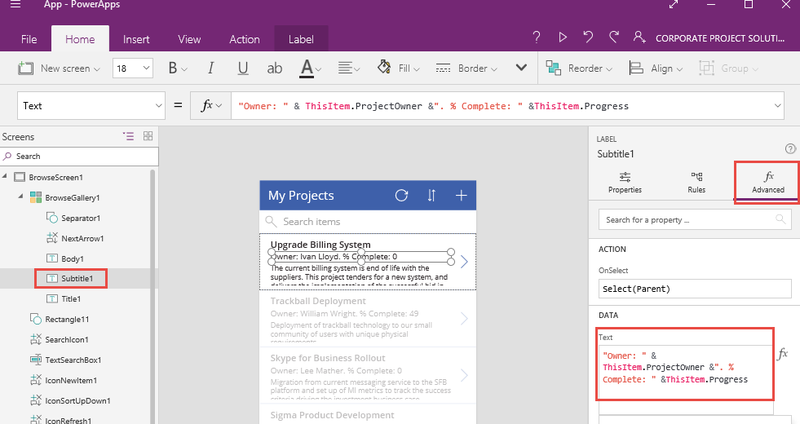 That’s it for now but hopefully enough to get you started with the Project Online Connector for PowerApps, there are more actions available for this connector and so much more you can do with PowerApps! 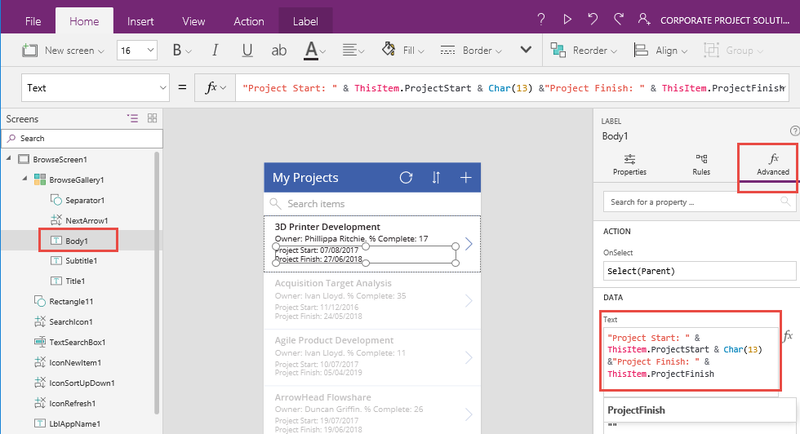 Look out for more Project Online related PowerApps blog posts in the future. 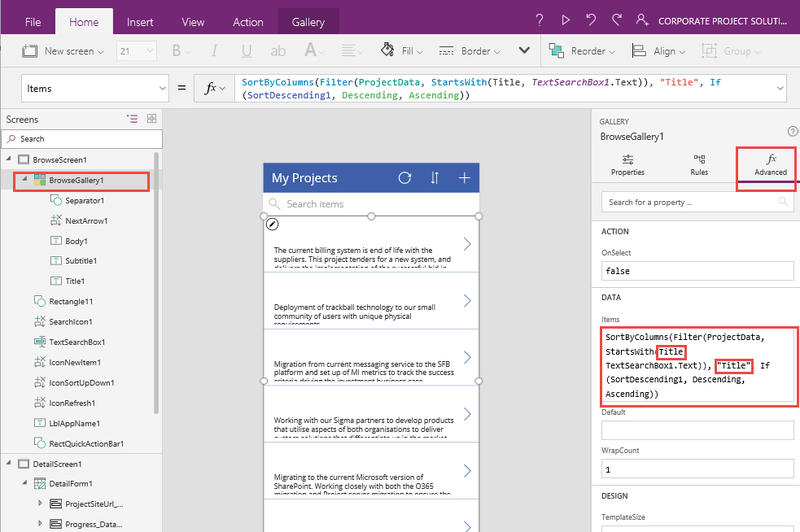 Update the query as required, for example update to the correct gallery name and update to the correct PWA URL. 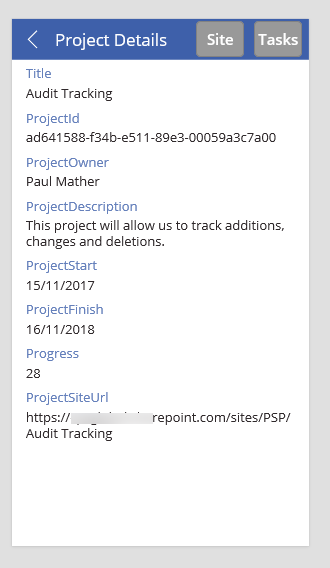 Now you have an app that will display a list of all projects directly from Project Online, then access the tasks from that selected project. 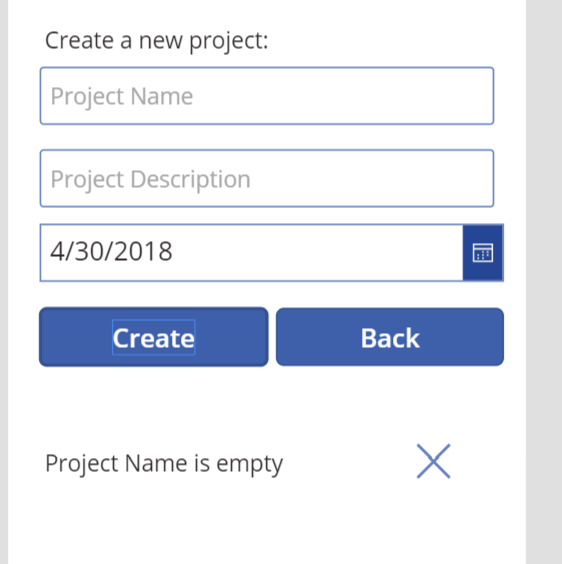 Next up we will look at create new projects in Project Online using the CreateProject action. 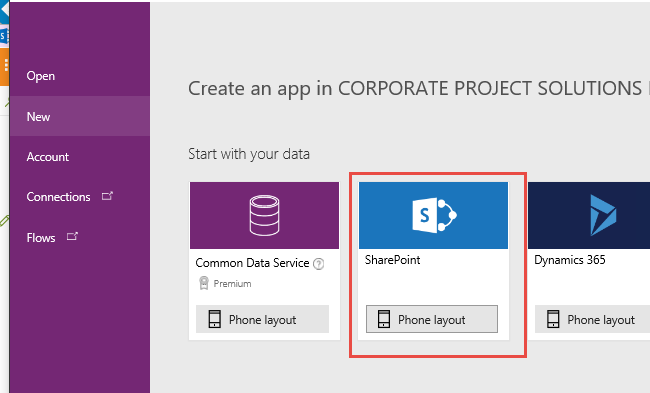 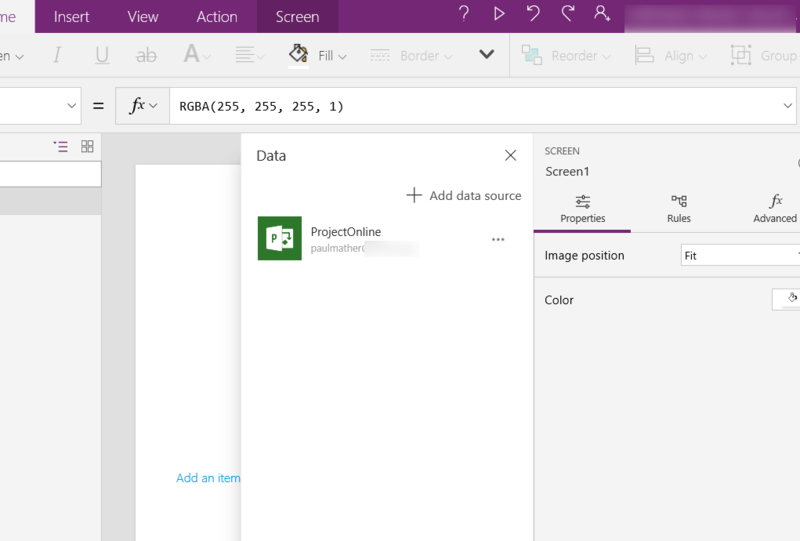 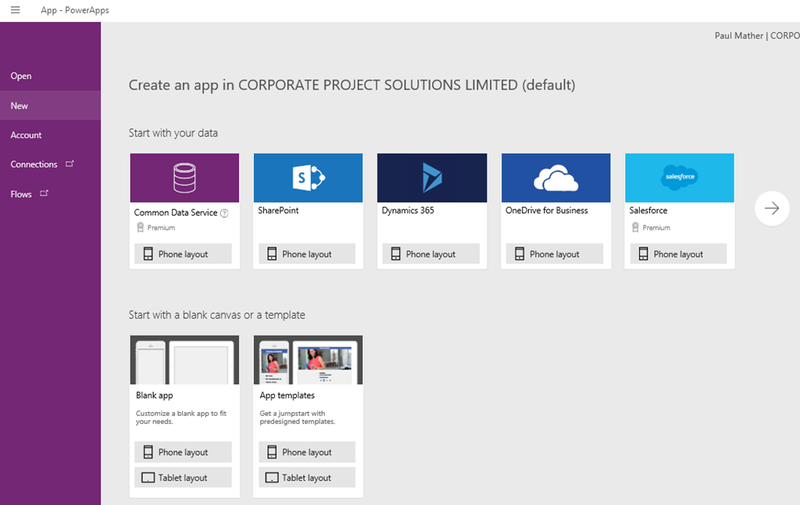 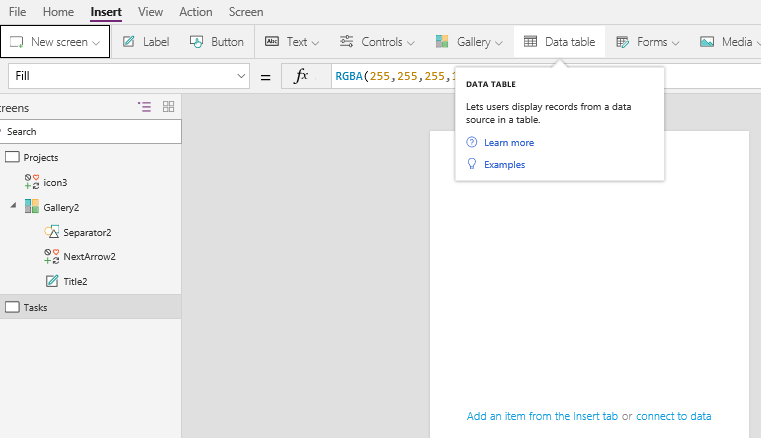 That particular example used a SharePoint list as the data source as there were certain properties I needed such as the Project Site URL that are not available in the native Project Online connector for PowerApps. 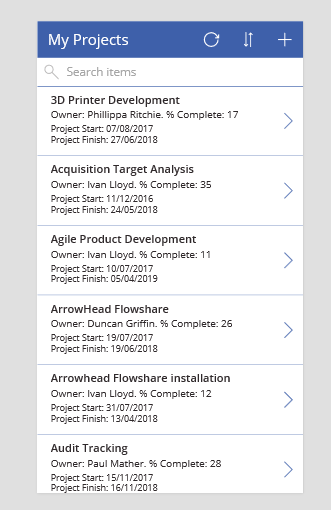 I also stored project images in that source SharePoint list and displayed those in my example app. 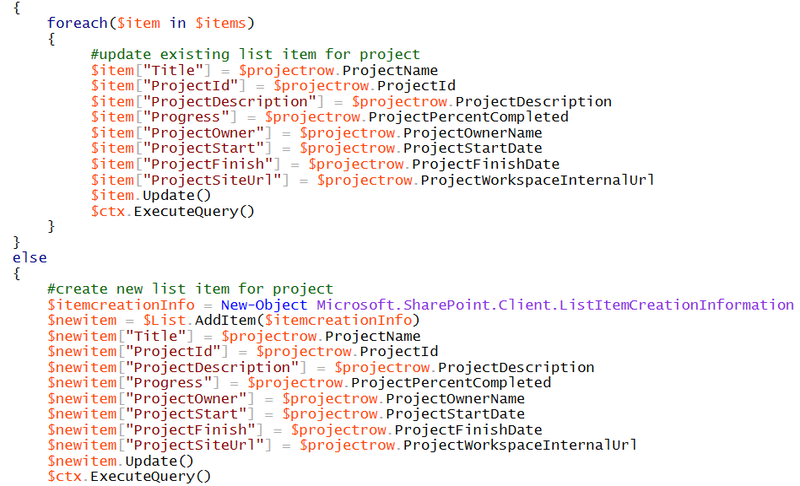 I used a custom process to populate the SharePoint list with the Project Online data and kept that data in sync. 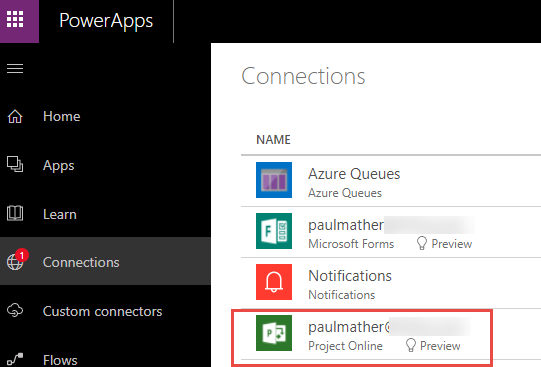 In this series of blog posts we will look at how to use the native Project Online PowerApps connector: https://docs.microsoft.com/en-us/connectors/projectonline/. 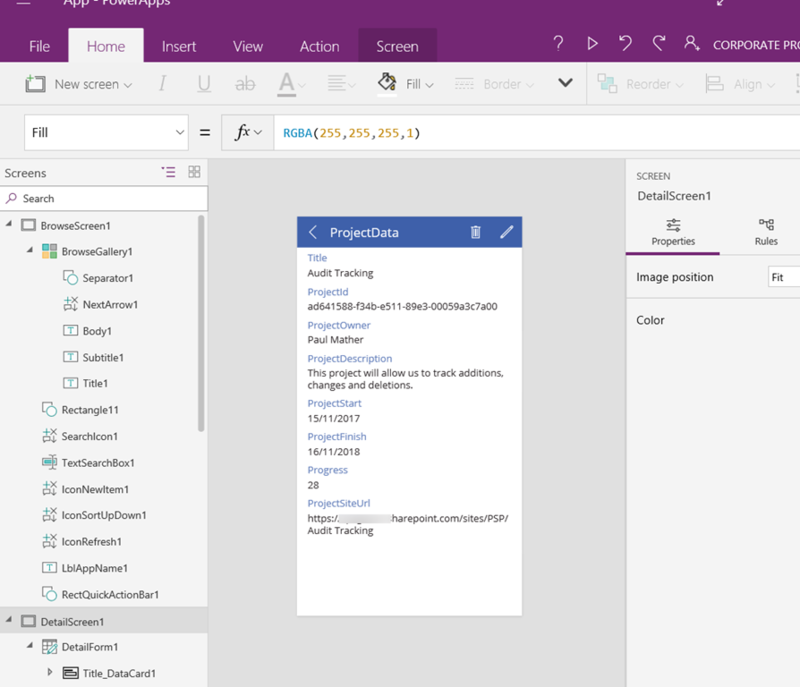 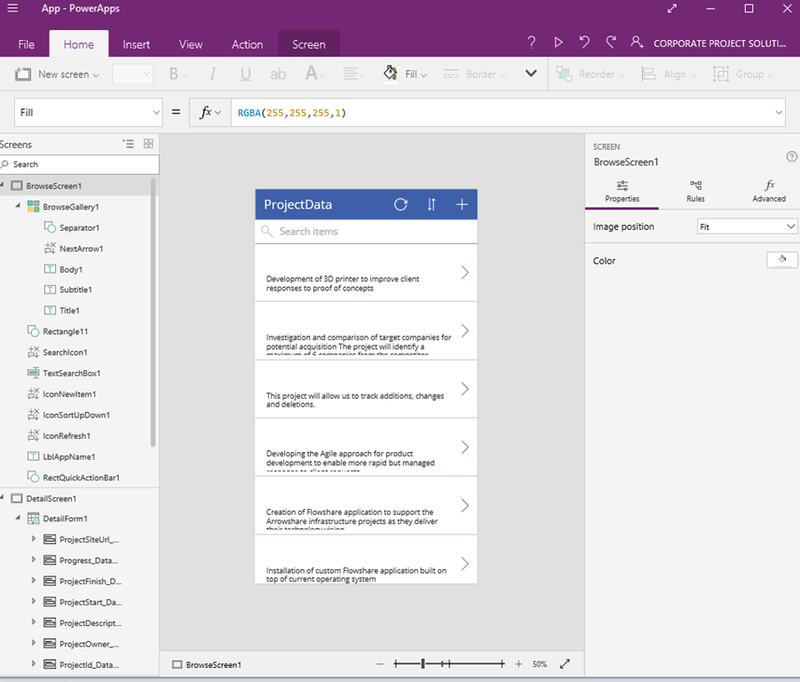 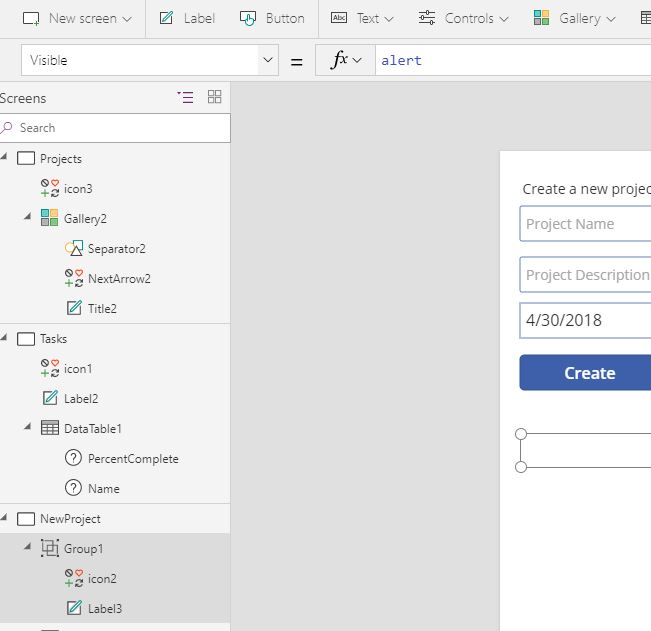 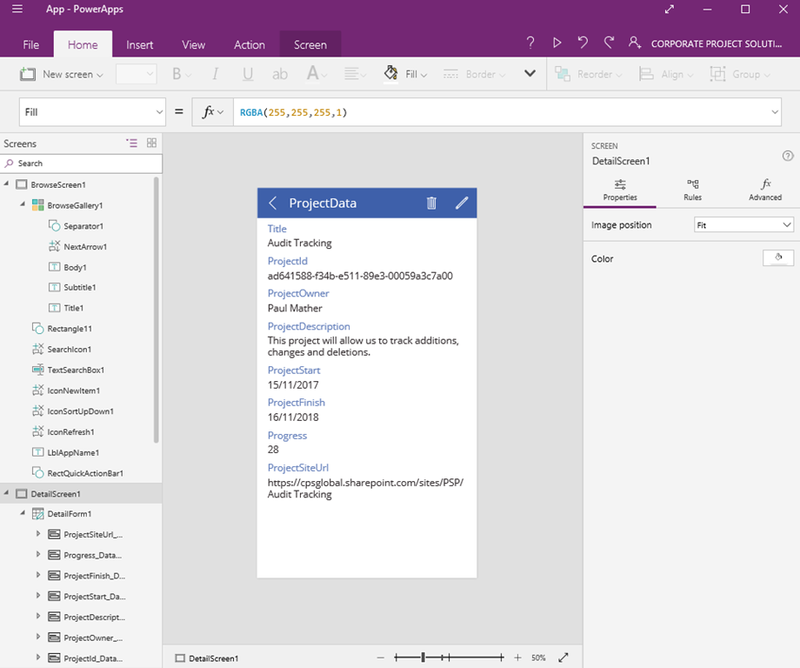 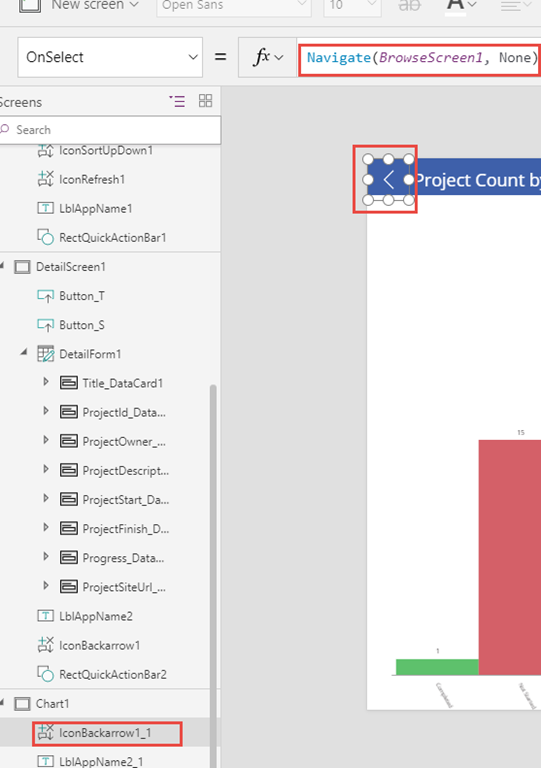 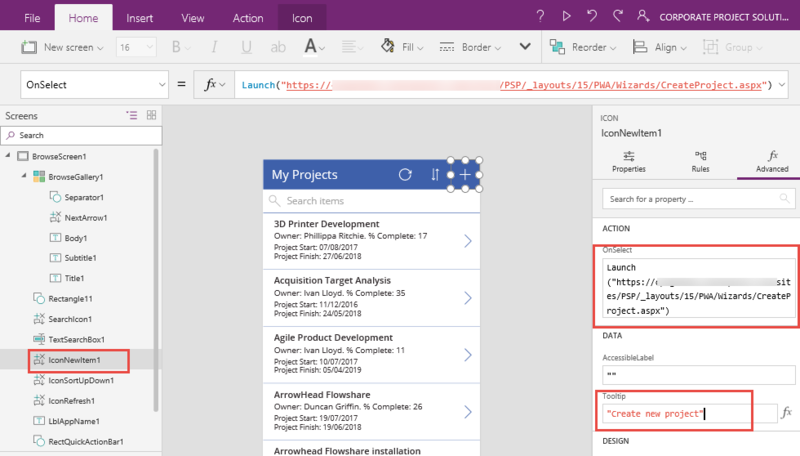 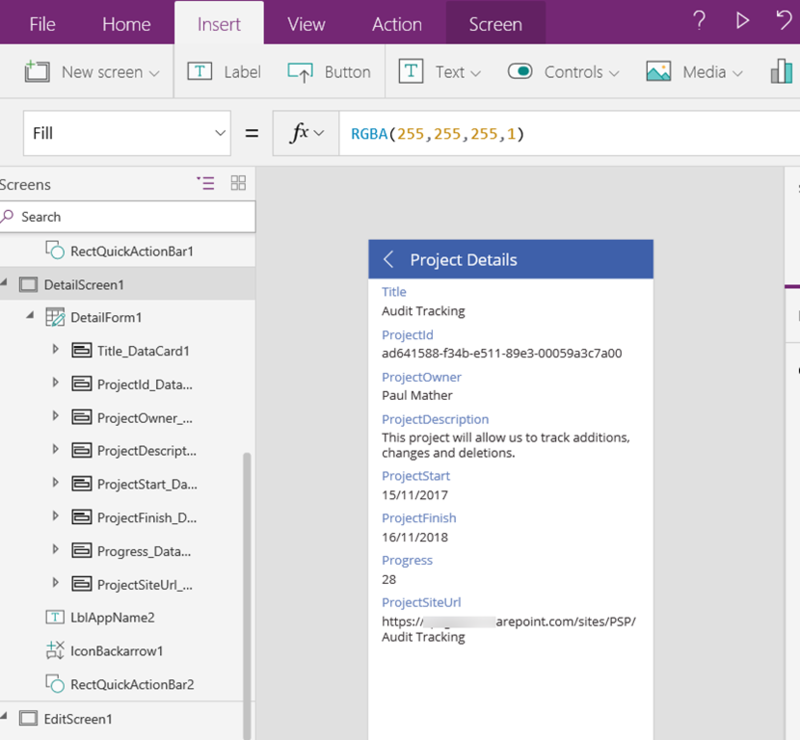 This connector allows us to perform certain actions in PowerApps such as read the list of Projects directly from the PWA site collection: https://docs.microsoft.com/en-us/connectors/projectonline/#List_projects or creating a new project: https://docs.microsoft.com/en-us/connectors/projectonline/#Creates_new_project for example. 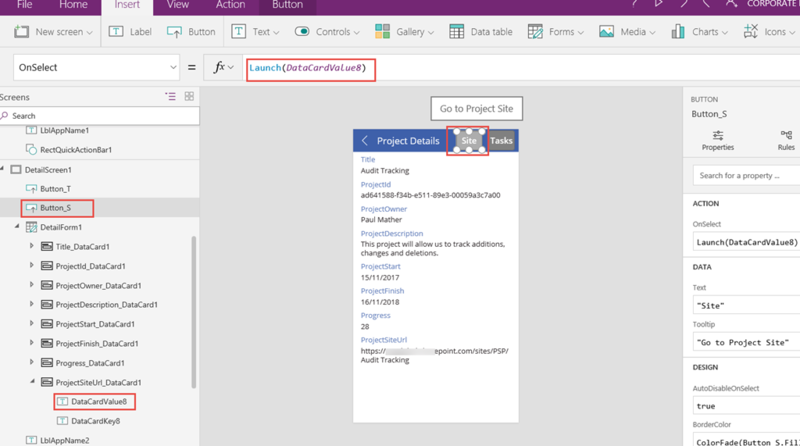 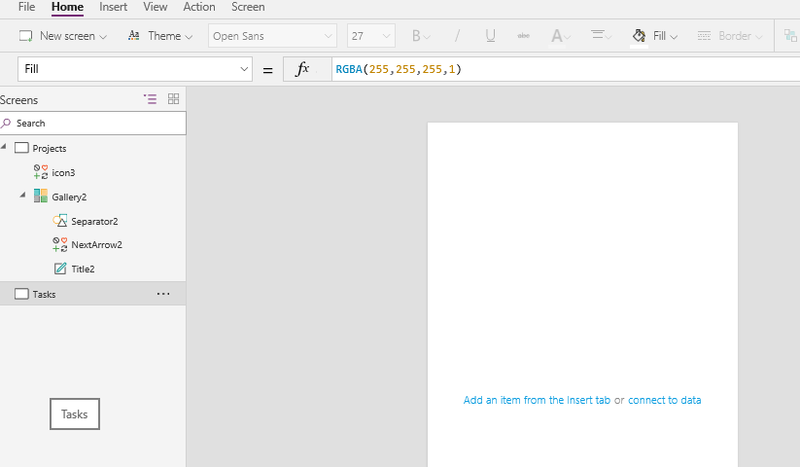 This series of blog posts wont build a full PowerApp using this connector but it will show snippets on how to use some of the Project Online PowerApps connector functions. 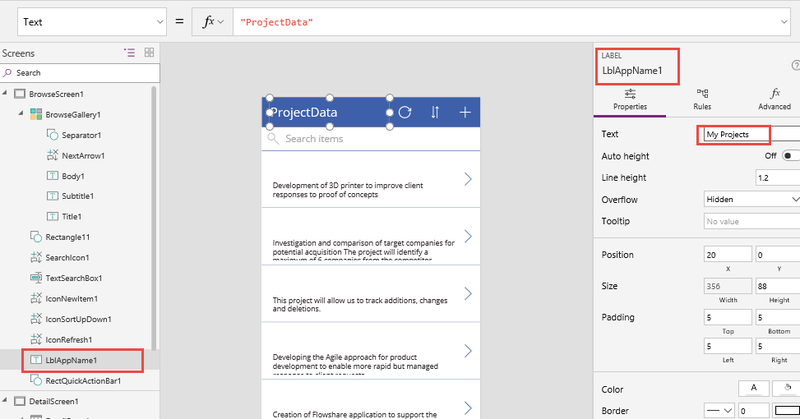 The first one we will look at is displaying a list of projects in PowerApps using the list projects function. 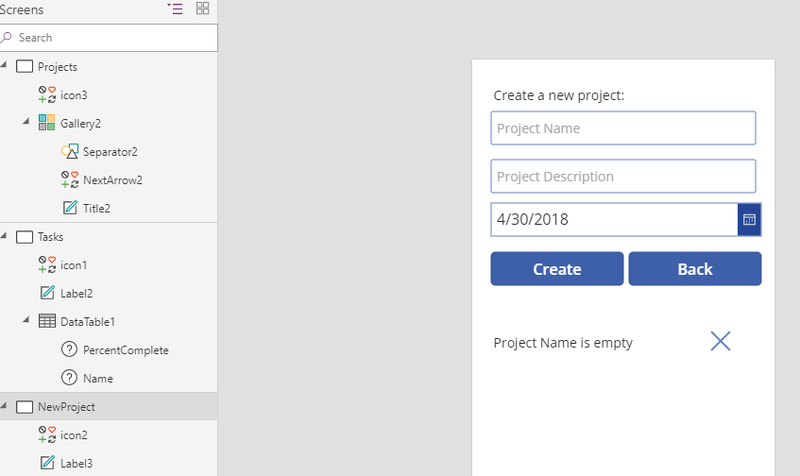 If you haven’t set up a Project Online connection yet, it is very simple, just click the + New Connection link and find Project Online then add. 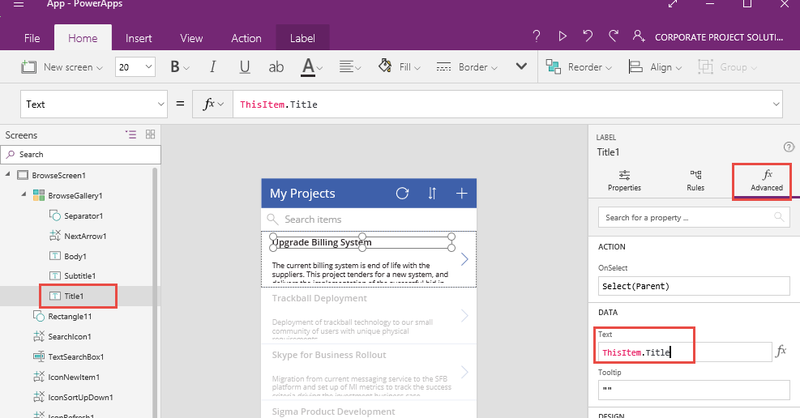 In the next post we will look at how to use the ListTasks function in the Project Online PowerApps connector. 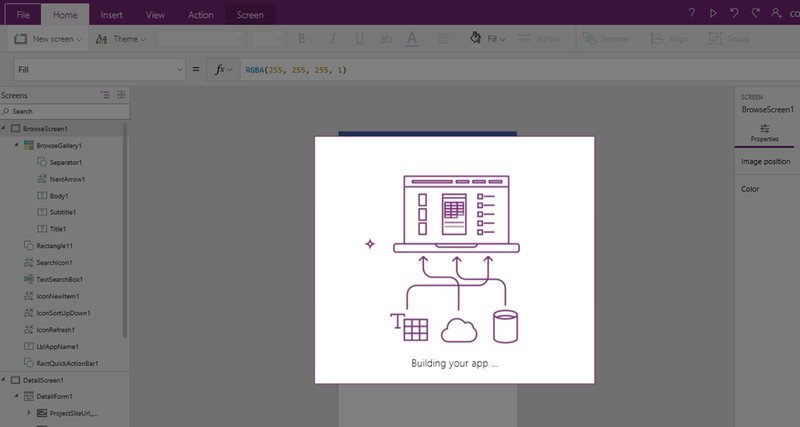 For details on Saving, publishing and sharing your apps see the links here: https://docs.microsoft.com/en-us/powerapps/save-publish-app & https://docs.microsoft.com/en-us/powerapps/share-app Users can then access your app using the browser, PowerApps Studio or the PowerApps mobile app! For the purpose of this blog post I will be using the Windows 10 App but the steps are the same. 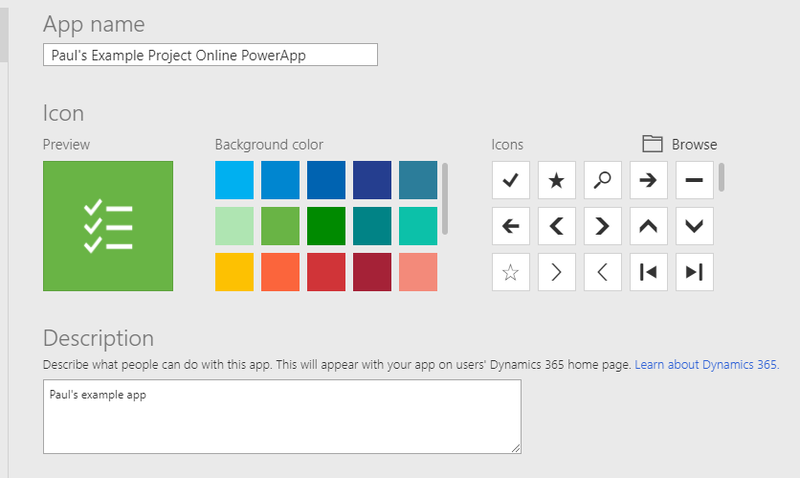 That might be good enough for some scenarios – pretty awesome given it was a click of a button! 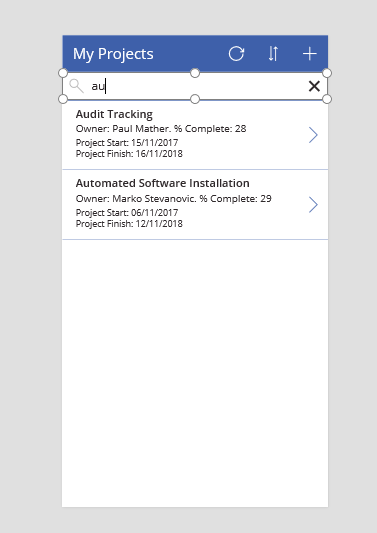 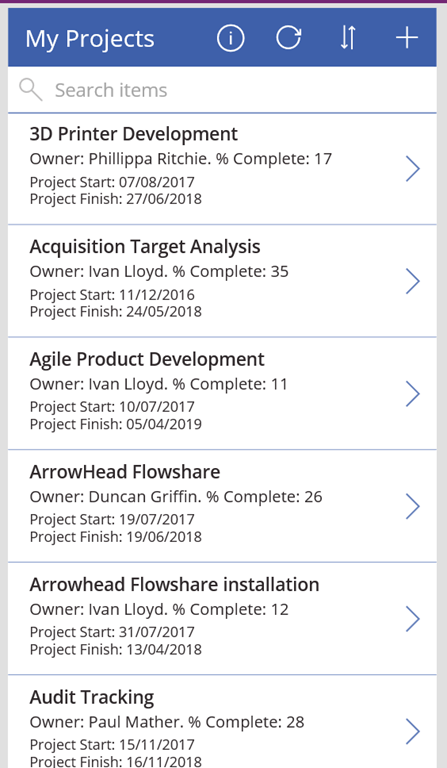 As mentioned, we will look to make a navigation type app that displays some high level project information so we will make some minor tweaks to the base app PowerApps kindly created for us. 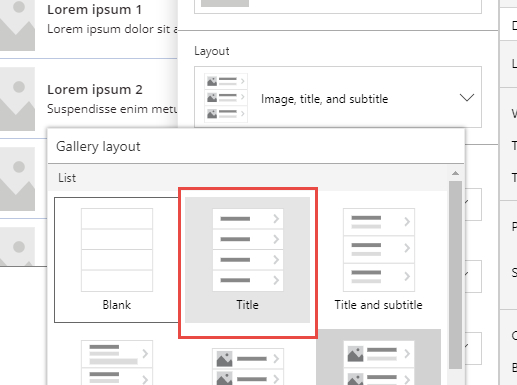 The search box and sort icon will now work on the Project Name – in our case this is Title on the source SharePoint list. 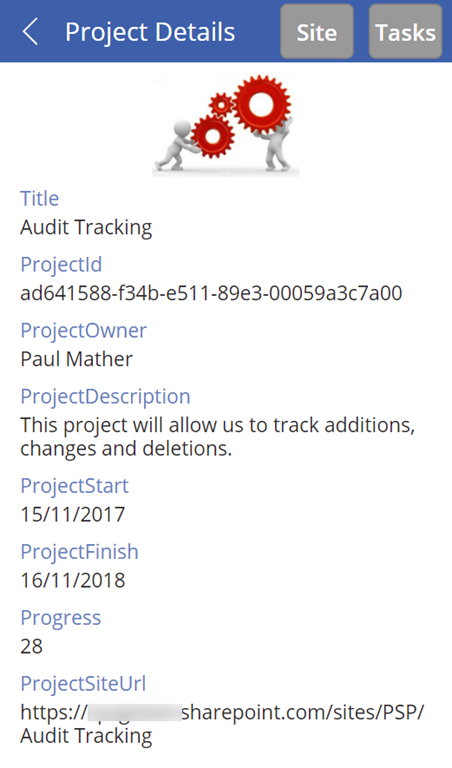 Worth noting is that this project data will not be security trimmed etc. 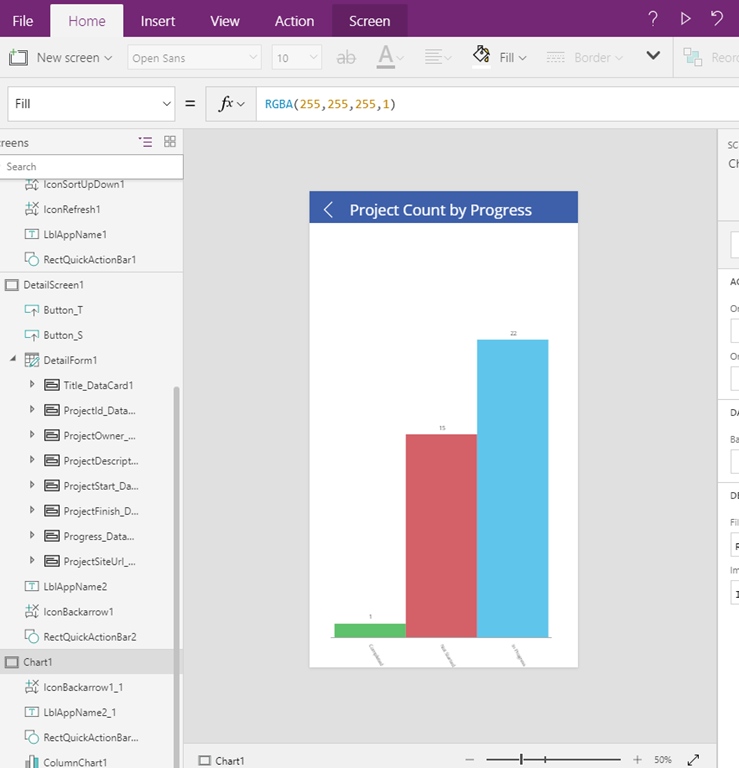 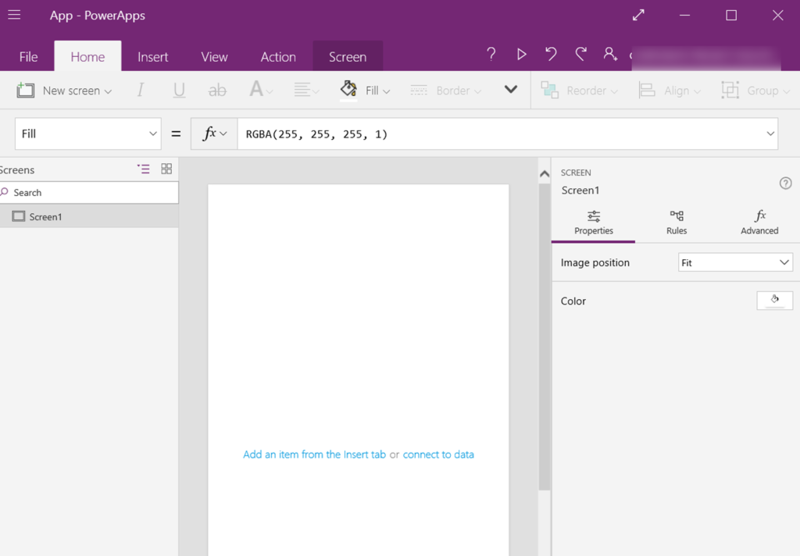 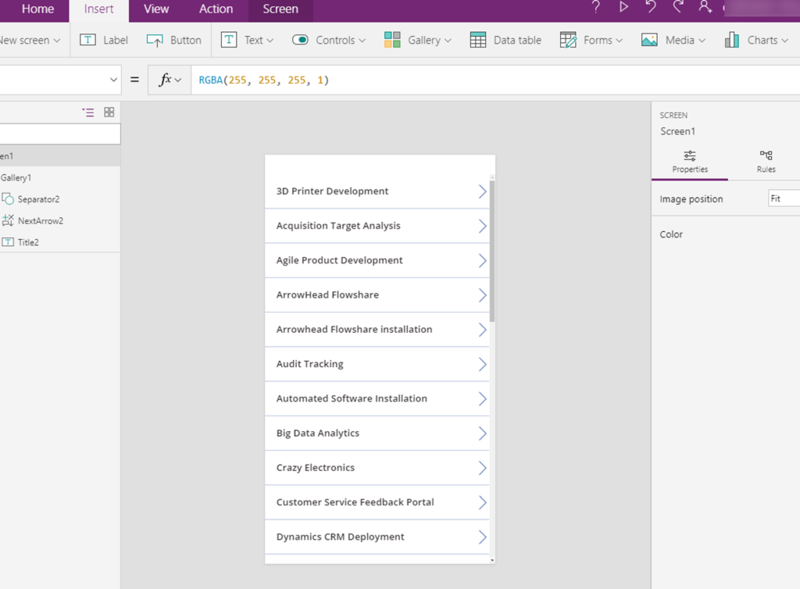 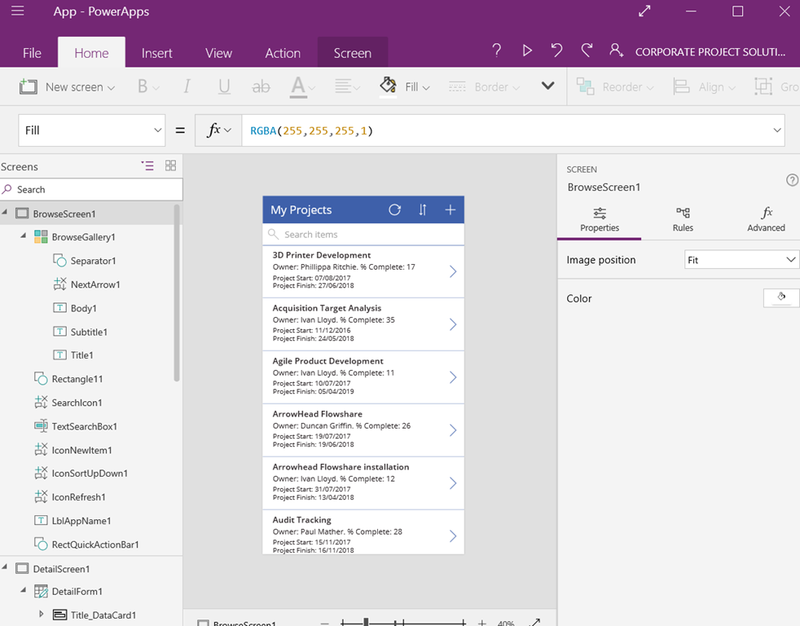 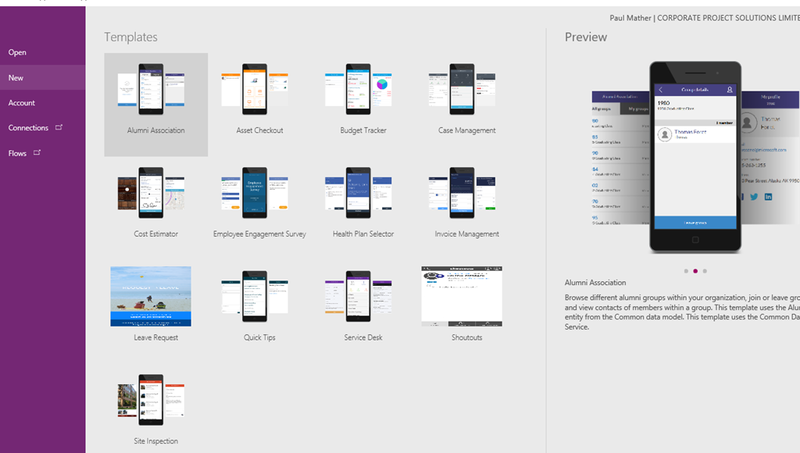 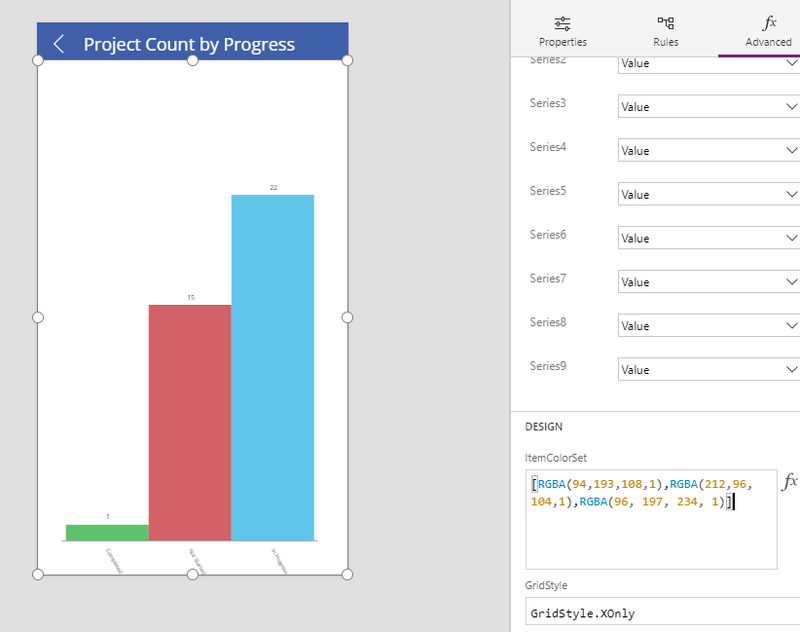 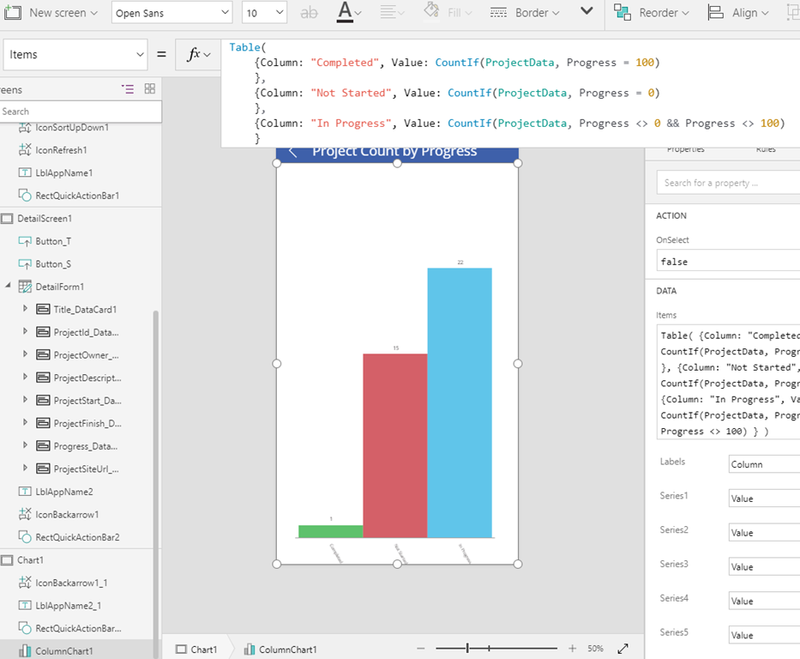 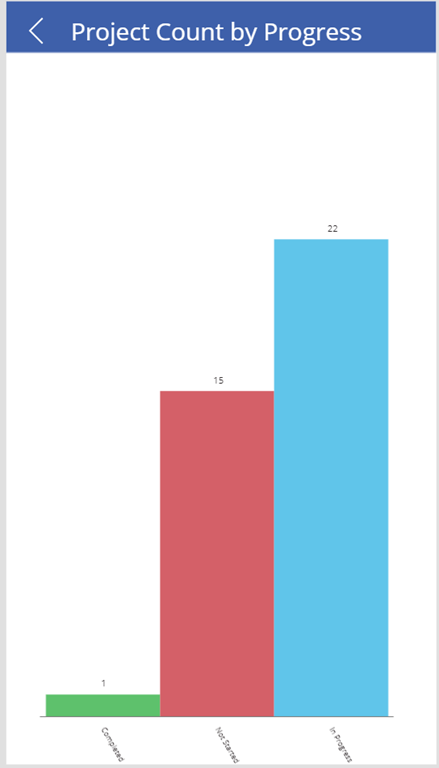 We have barely touched the surface of PowerApps but that is it for Part 1. 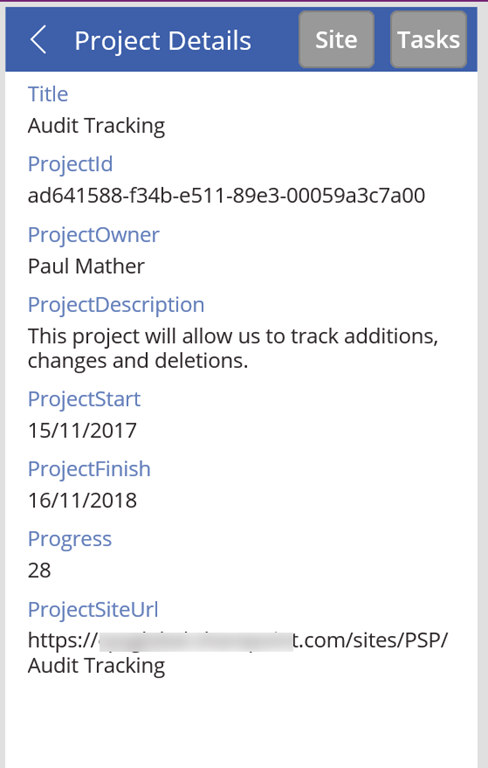 In Part 2 we look at updating the detail view and adding in links to navigate to the project in PWA.